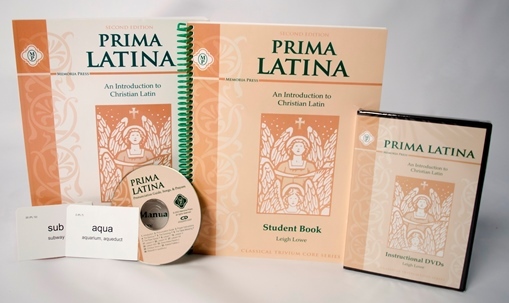 Memoria Press makes learning Latin easy. For years I have dabbled in teaching the kids Latin with flashcards, and workbooks that teach Latin word roots but I never dived all the way in because it was just too intimidating for me to teach a language that I new ZERO about. I will be honest and share that I never considered Latin through Memoria Press because plain pages and the simple “no bells and whistles” approach didn’t really appeal to me. As a previous elementary teacher I’m drawn to bright fun colors and busy pages. We also only use a classical approach to our learning in some areas, so this was another reason I never thoughtfully considered this program. It does exactly what you would hope any language program would do for you or your children. The full curriculum set comes with A Teachers Guide, Student Workbook, An Instructional DVD with the lessons, A CD with Pronunciation guide, songs and prayers and flashcards. This curriculum set has 25 lessons that are about 15-20minutes long each. I really like the program, and more importantly so do my kids. They enjoy our Latin lesson time. The Magistra (Female Teacher) speaks clearly and pleasant. The lessons are very sequential . I really appreciate the general set up of each lesson. I like that the video teaches the lesson, complete with vocabulary, grammar, derivatives and a Latin prayer. If we need extra practice with the pronunciation we can listen to the CD. My children watch the DVD and then we play a game with the vocabulary cards before they begin working on the workbook. This set is intended for Grades 1-3, But as you can see I used it with all of my children. I had originally just intended to use it for my youngest but unless you have a child that can read and write well, they may struggle through the workbook. I like that our Magistra Leigh Lowe does a great job reviewing concepts taught from previous lessons and for me it is really important that they see the connection between our English words and the Latin ones. I appreciate that there is a fair amount of time reviewing the derivatives of each of the vocabulary words. At the end of each lesson they practice saying a line to a prayer. Each lesson builds up to a complete prayer by the fifth lesson. This program is really what I have been looking for to teach Latin, but didn’t really know it. The best part is that it takes little teacher prep. Your student just needs the video and their workbook and they can do the lessons independently. Memoria Press lets you print off the slides from each lesson, which is AMAAAAZING. I love that I can do this to give my children a little extra support. It was easy enough for me to take some of the concepts that I knew they would want to review and put them in a mini lapbook. If you want other honest opinions about different Memoria Press products please check out the Review Crews page. Stick around and check out my other reviews.